We can take advantage of collaborative Internet work to get a wonderful and helpful output. 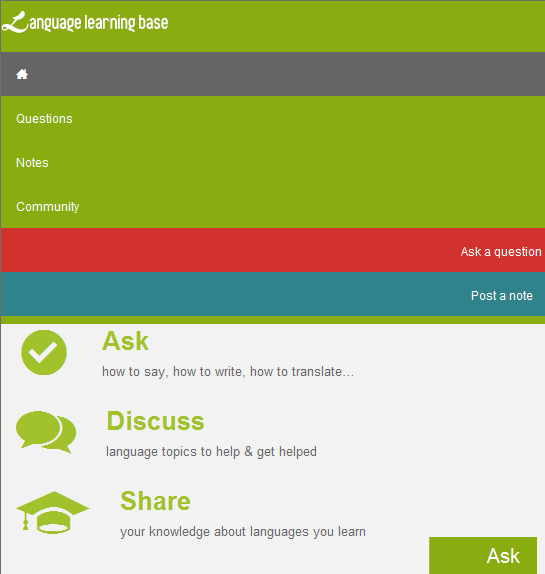 Here is another one: Language Learning Base designed for language learning; isn't it what the doctor would order? I already posted several articles pointing to one of their entries. This is a thread dedicated to this organization and we can freely access their entries; we can also help them develop the base. There are several ways how we can communicate our agreements or disagreements. Gérard those expressions are very useful for our forum and help to be friendly without accepting everything ! Prepositions of direction show us to where or in which direction something moves. Here are some of ... supermarket. away from - Stay away from Tom. Commonly Used English Phrases in Conversations. How to end a conversation. The woman came forward with her husband’s finger prints. The art of origami comes from Asia. The paint is starting to come off the wall in the kitchen. Come forward = volunteer for a task or to give evidence The woman came forward with her husband' ... Nobody here cares whether or not you can dance. Tx Gérard, I think I am all right with that phrasal verb ! A]Collocations with HAVE, TAKE, GET. Collocations with HAVE, TAKE, GET . Making Suggestions Refusing Suggestions Accepting Suggestions ... are your thoughts? Do you think this will work? Starting Conversations - English Conversation Lesson . Useful Phrasal Verbs (check, come, cut) . Linking words are very important for written and spoken English. Linking words or phrases help ... assignment by linking one statement to another. English Insulting Slang. Top 10 Most Beautiful British Insults. Gerard do americans insult wth the same words? MurielB a écrit: Gerard do americans insult wth the same words? No Muriel, they have far more than in the rest of the "British Empire" but less than in Oz. English Insults can sound harsh to a French ear but insulting words are so common in English that they became just casual. it would be interesting to write about them! Yes you read well: daily words! Tx Gérard, i have just read them but I won't use them ! Learn Some Slang! 10 Useful Informal Expressions for English Learners. 10 Useful Informal Expressions for English Learners. Gérard you already have written about "to chill out". I am pleased because I wanted to remember it and I did ! MurielB a écrit: Gérard you already have written about "to chill out". I am pleased because I wanted to remember it and I did !